Egyptian President Abdel-Fattah El-Sisi is scheduled to hold informal talks with Russian President Vladimir Putin and discuss joint projects with Prime Minister Dmitry Medvedev in Russia on Tuesday, the second day of his three-day visit to the country. El-Sisi and Medvedev "plan to discuss the state and prospects of developing bilateral trade and economic cooperation with an emphasis on large-scale joint projects in energy, industry, agriculture and other spheres," the Russian government's press service said. Talks between Putin and El-Sisi will take place in the evening in an informal format in the Black Sea resort city of Sochi, Kremlin spokesman Dmitry Peskov told reporters on Monday, according to Russia's Tass news agency. "This is a very efficient format of communication, which enables the heads of state to discuss the most topical issues in private before the official talks," Peskov said. Also on Tuesday, El-Sisi is due to give an address before Russia's upper house of parliament, the Federation Council, in what Egypt's state news agency said would be the first time a foreign president had addressed the council. The Kremlin said earlier on its official website that El-Sisi and Putin would hold official talks on Wednesday to "discuss key issues regarding the further development of Russian-Egyptian cooperation and exchange views on current international matters." 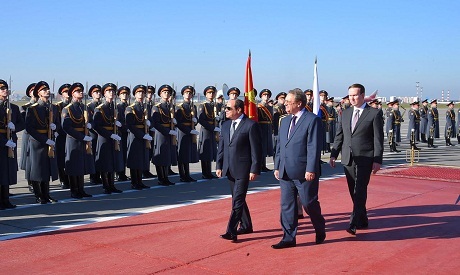 El-Sisi began his visit to Russia on Monday with a meeting with the chairman of the Eurasian Economic Union Tigran Sargsyan in Moscow, where they discussed boosting relations between Egypt and the union.